The Google Play Store may have millions of different apps, but it doesn’t always have what I want. Have you even tried to install an app and saw this message instead? Or worse yet, have you ever gone looking for a specific app like Amazon Underground or MiXPlorer? You won’t find them the Google Play Store. Especially when there’s no good reason for it. That’s one of the reasons I’m a big fan of using a VPN for Android to get around geofiltering. But fear not, my faithful readers. There are ways to get around Google’s defenses. 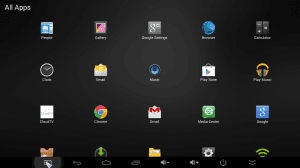 To do that you’re going to have to learn how to sideload Android apps. 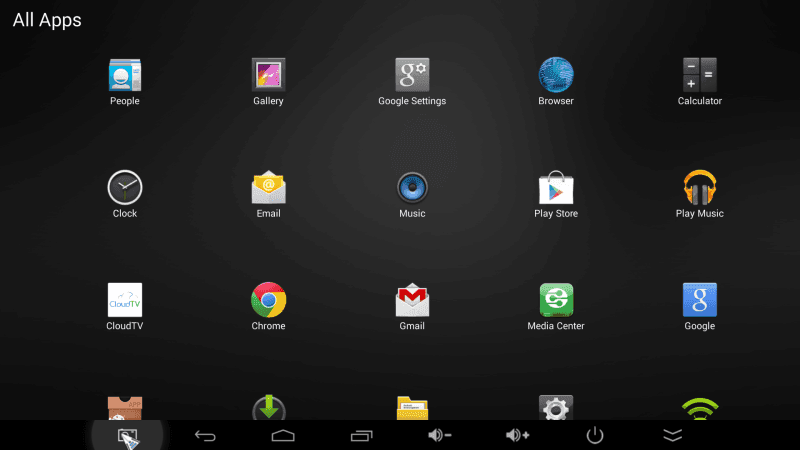 First things first…just what is sideloading? You’ve probably heard of uploading and downloading, so let me explain sideloading in the same way. Think of where you’re sitting right now, reading this post on your computer, smartphone, tablet….whatever device you want. Now imagine that “the Cloud”, or “the Internet” is sitting right above your head. It’s like Eeyore gave you his personal little rain cloud and it’s hovering right above your head. Except instead of rain, it’s dispensing this article for you to read. Anything you want to get from the Internet is a download, because that information is coming down to you. Likewise, any time you want to send something to the Internet, you’re sending it up, so its called an upload. Now take your TV box and put it right next to you on the table. You don’t actually have to do this, but just imagine. You have something that you want to get from the computer\tablet\smartphone to your TV box. That data isn’t going up (upload) or down (download). It’s going to a device on the same level as you. That is sideloading in a nutshell. or…What files can you sideload? 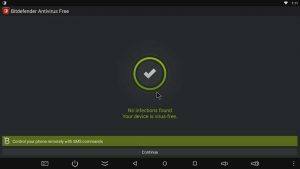 The most common thing you’ll want to do, and probably what led you here in the first place, is to sideload APK (Android aPlication pacKage) files. As I said in the beginning, the Google Play Store puts restrictions on what apps you can see and download. Personally, I’d like to decide for myself what I can and cannot put on my own device. That’s the power of sideloading. You can install almost anything because many of the filters and restrictions happen at the App Store level. Sideloading basically gives you the power to put whatever you want on your device. For TV boxes, sideloading is especially important for two reasons. Apps are coded so to be compatible with certain hardware. It can look for that hardware by feature (2GB of RAM, screen resolution, etc.). Or it can look for specific device model numbers if the developer has a really good testing team. This is rare, but I’ve come across it on a few occasions. Looking for specific hardware can be problematic. Android TV boxes have pretty much the same hardware as your smartphone or tablet, except for one important part. If the app you want to install depends on a certain screen resolution…actually if the app depends on ANY specific screen resolution, you’re in trouble. 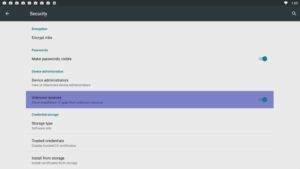 The Google Play Store will look at your TV box and decide that it doesn’t meet the minimum requirements to run the app. No app for you. What if your brand new device doesn’t come with the Google Play Store at all? This happens when the manufacturer or device are not certified by Google. This not only affects the Play Store, but other Google apps like YouTube, Gmail and Maps. It’s less common now than when TV boxes first hit the scene, but I still hear about people buying Android TV boxes that don’t have the Google Play Store pre-installed. If that happens, the user will have to sideload an alternative app store, or manually sideload every additional apps that they want. It’s not easy to get an app into the Google Play Store. 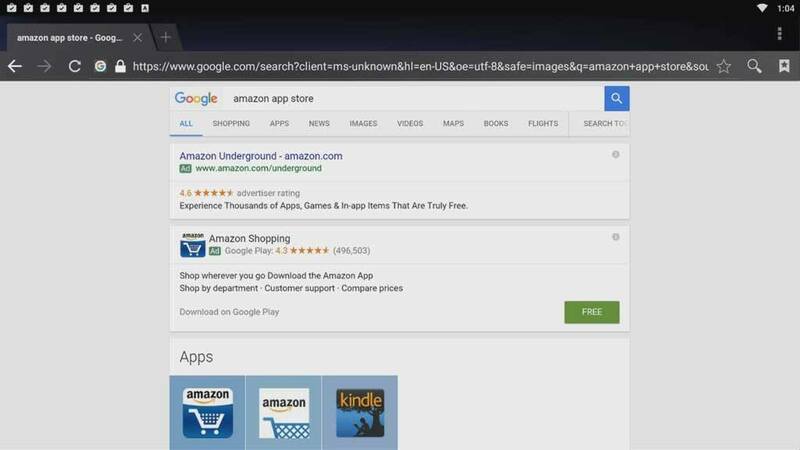 Google checks every app for viruses and other malware before they’re approved and available for download. Make no mistake: Sideloading apps opens your system up to threats that normally might be caught before they get to you. Every tutorial I’ve seen on how to sideload apps misses the important step on re-securing your device after you’re done. So be sure to stick around to the end of the tutorial. 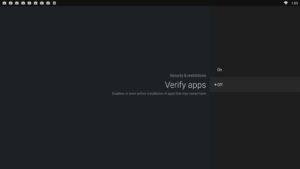 I’ve written before on how to protect your device against Android TV box viruses and malware. I highly recommend running some sort of virus protection on your device. Even if you only use a free version, it will still help to protect your device. 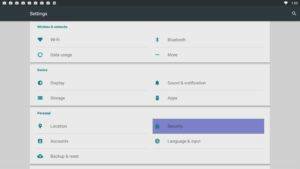 If you sideload apps, get virus protection. Period. 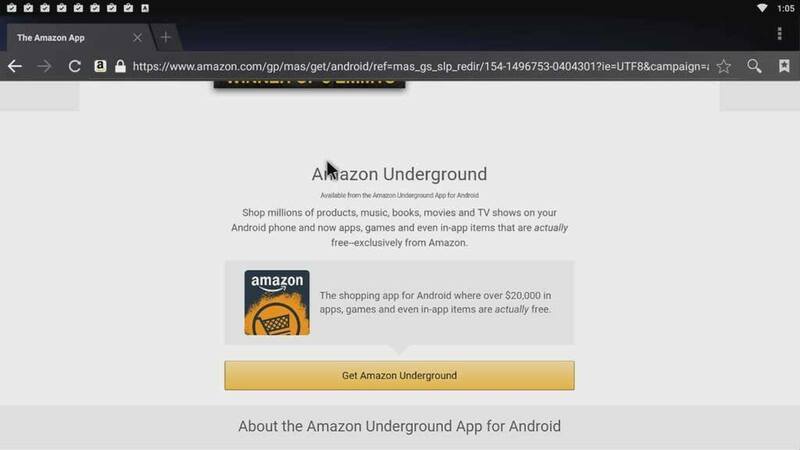 I’m going to take you through how to install Amazon Underground, Amazon’s own app store. 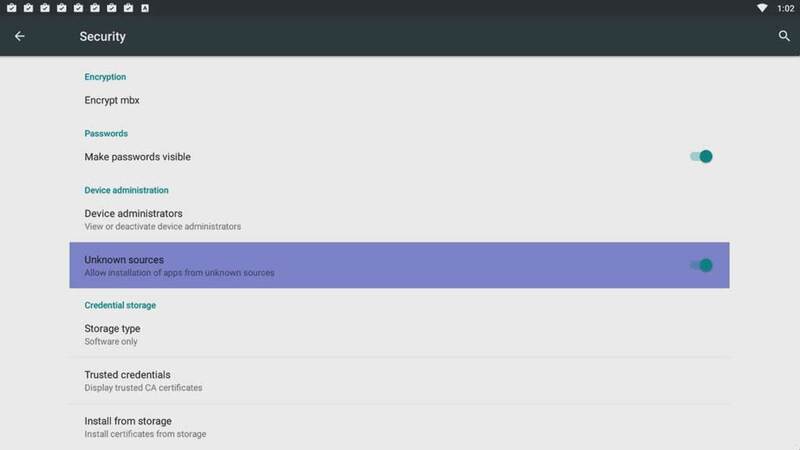 The first thing you need is some sort of file manager for your Android device. If you’ve already got one installed, you can skip ahead to step 2. The most popular one, and my favorite, is ES File Explorer. If you don’t have it installed, you can download it from the Google Play Store, or whatever app store came with your device. I’ve never come across an Android TV box that didn’t come pre-installed with either a file explorer or an app store. The manufacturers usually need one or the other to install their software. Once you install it, open it up just to make sure that there aren’t any additional setup steps. 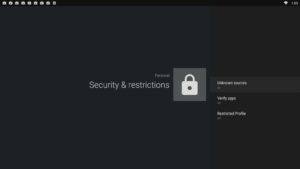 Enabling Unknown Sources is a setting found in the Security tab of your main Settings Screen. Depending on your device, it may look slightly different, so I’ll show you two ways to find it. Don’t worry, you’ll only need one of these. This can be different for every launcher, unfortunately. Most companies will put a Settings icon on the main home page which looks like a set of mechanical gears like this one on the bottom row. If you don’t see an icon on the main page, go to the screen that shows all of your apps arranged in a row like this. Note: You may have two “Settings” icons on your page, as you see in this image below. You don’t want the “Google Settings” on the top row. The one you’re looking for is the gear shaped icon in the bottom row, second one from the right. Once you find the Security Settings, open that menu by clicking on it. If you don’t understand that warning that means you skipped past my “A Word on Security…” section above. You should definitely go back up and read it. It’s OK. I’ll wait. Sideloading was initially used to describe transferring a file from one device to another, but the term has expanded since then. 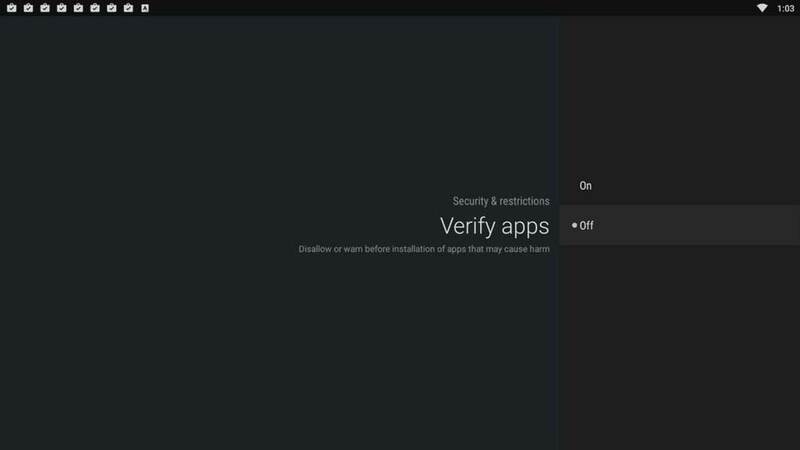 Nowadays we call any type of installation where we are bypassing the normal procedure as “sideloading.” In this case, we are bypassing the Google Play Store. You have a couple of options for how to get the file. If you can download it on the same device that you’re going to install it on later, you’ll end up saving a lot of time. Amazon changes up this page often, but no matter what they do to the top part of the page, there will always be a button or link that looks something like the “Get Amazon Underground” button above. Click on that to begin the download process. They give you a very brief set of instructions on how to sideload apps from unknown sources, but neglect to mention anything about the security risks involved. While disappointing, it’s not very surprising. 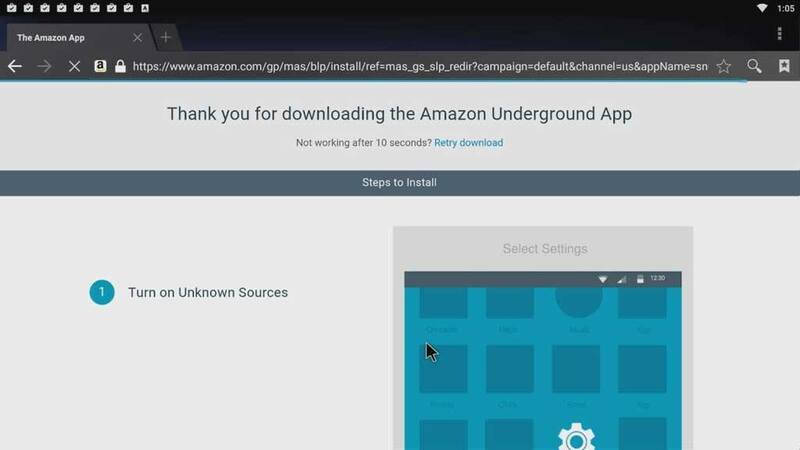 In order to install anything from Amazon Underground the Unknown Sources setting would have to remain on. 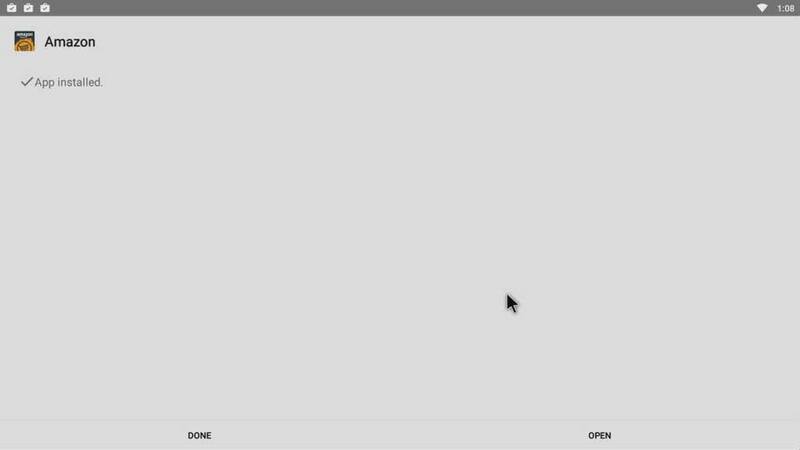 But I’ll go more into my recommendations at the end of this tutorial. If you were wondering why you installed ES File Explorer first, then here is your answer. Once the file is downloaded, you can open it right from the notification window, as shown above, or through ES File Explorer separately. Either way, having a file manager installed will allow you to open the .apk file directly. Once you click on the .apk file, you’ll be taken to an installation window. 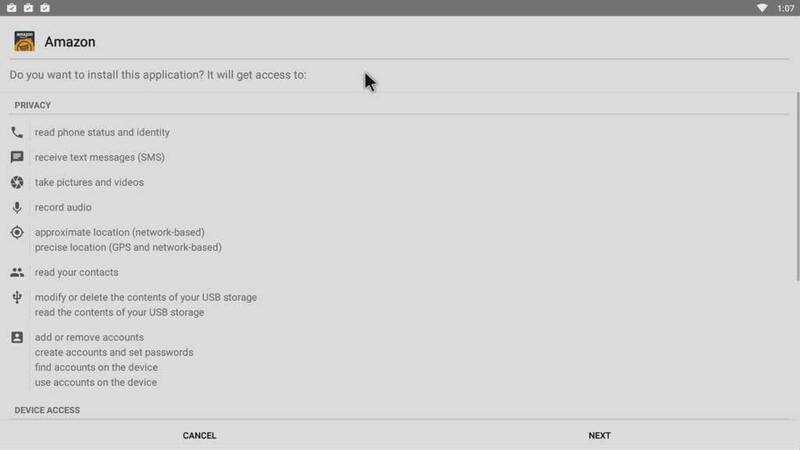 This may look different depending on the file you’re installing, but will usually detail what permissions it is asking for access to. 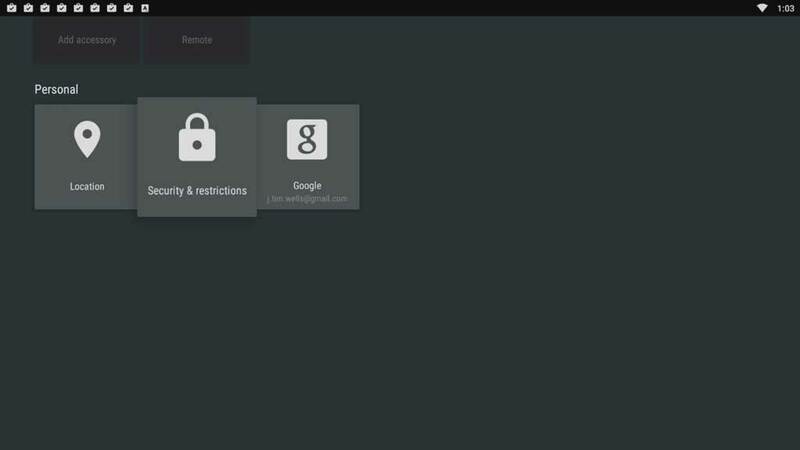 Remember to make sure that the permissions match the app. For example, if you’re installing a photo editor, you should be a little worried if it’s asking for permissions to send and receive text messages. Once the setup process is complete, you’ll get a simple message saying the app is installed and you’ll have the option to open it. If you can’t download the file directly on the device that you want to install it, then the process becomes a bit more involved. What you’ll want to do is hook up your TV box directly to your PC or Mac using a micro-USB to full-size USB cable like the one below. Usually your TV box will come with one of these in the box. If not, they’re fairly inexpensive and can be picked up at Amazon or any local electronics store. 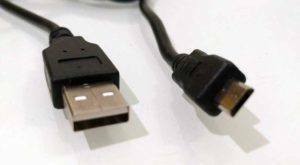 A decent quality cable shouldn’t be more than around $5. If you’re using your PC, Windows will recognize your TV box as any other external device like a flash drive or external hard drive. You’ll be able to navigate through the directory and save your files wherever you like. A word of caution: Be careful what touch. 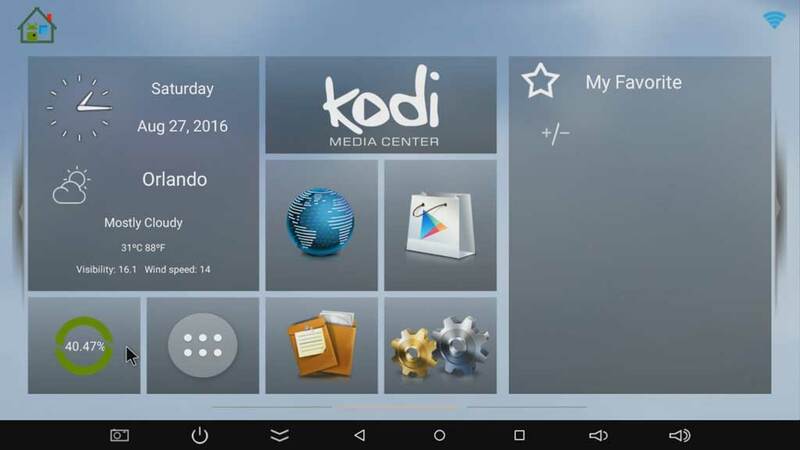 Changes you make here can cause your Android TV box to become unstable or crash. I highly recommend only putting files in the Download folder or any folders that you have created personally. 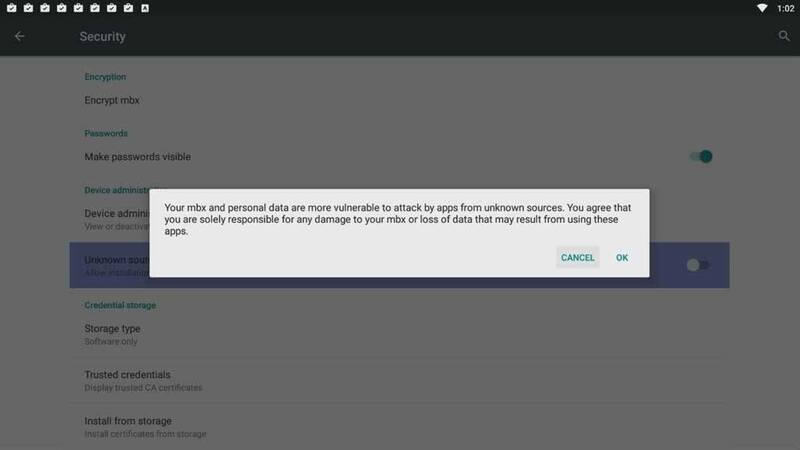 As I’ve said before, when you turn on the option to install apps from unknown sources, you are removing a layer of security from your device. I highly recommend to only enable this setting when you are installing an app and turn it back off immediately after you’re done. Obviously, that won’t work for everyone. 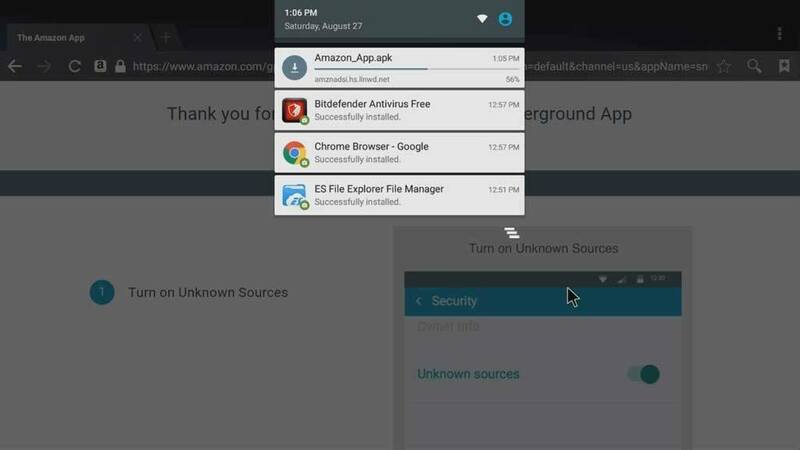 By default, every app on Amazon Underground is technically from “unknown sources.” Anytime you want to install a new app from there, you would have to enable Unknown Sources again. Most people aren’t going to put up with the hassle. Google has a setting called App Verification. You’ll find this in the Security section of the Settings page. 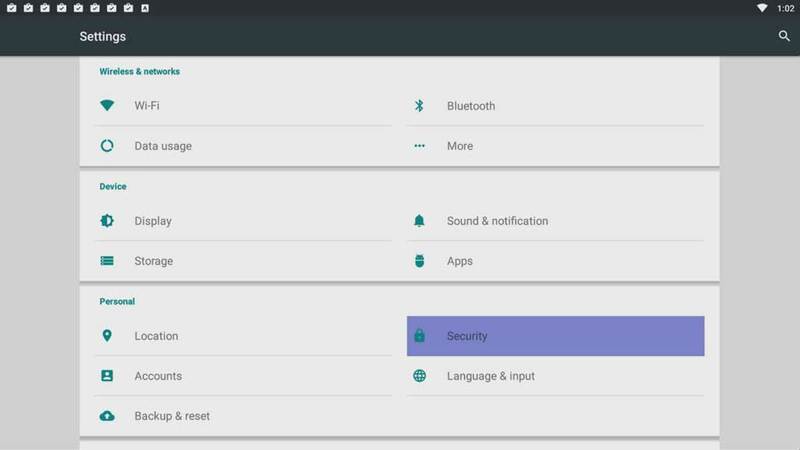 If you enable it, it will allow Google to regularly check your device activity for security problems, and prevent or warn about potential harm. That is a nice way of saying that your device will monitor you and take some basic steps to make sure you don’t break anything too badly. Many people will dismiss it as being too intrusive, but I believe that you can’t ever have too much security for your devices. 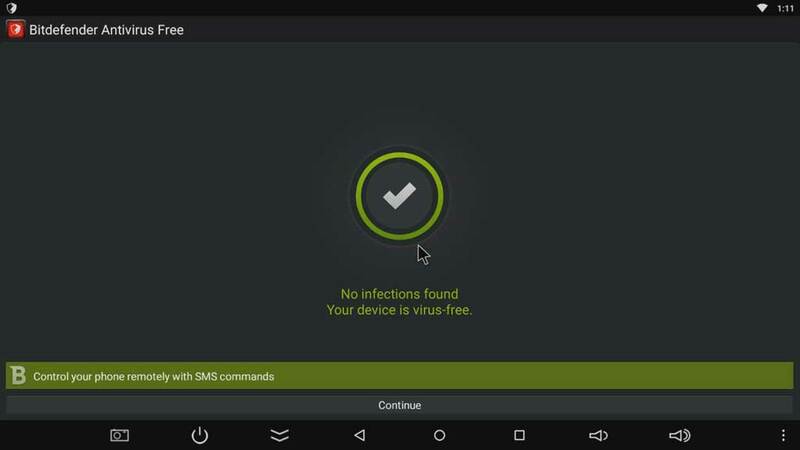 You need to take steps to keep your device safe from malware and Android viruses. 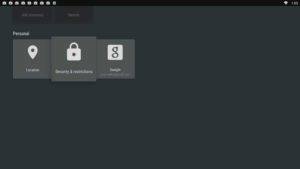 One of the easiest and most effective ways you can do that is to install some sort of virus protection on your device. Seriously. If you have a PC, chances are your anti-virus program has a service which will also protect your mobile devices. If not, there are plenty of free options out there as well. Personally, I use BitDefender to keep both my PC and smartphone safe. Even the free version (shown to the left) gives me piece of mind that something is watching out for any malware that might infect my system. There’s a whole world of apps out there besides what we’re used to seeing on the Google Play Store. Hopefully this tutorial will help you go out and see what you can find. If you come up with any questions, leave them in the comment below and I’ll do my best to answer them. My question to you: What is the first app that you’re going to sideload to your device? Let me know! Excellent and very helpful article. Wished I had know this months ago, ha ha. Err…the directions are in the article. Great info Tim as always thanks for your hard work. Always look forward to your tutorials and reviews. Never knew how easy it would be to sideload an app. Now I’m not hesitant in buying a device that requires sideloading apps. I know several of my friends that will appreciate this info also. Forwarding now! Thanks! On my Beelink GT1. all of a sudden I can’t install any APK’s. I click the install button and nothing. Last week I could install anything?? Is there somewhere else on the system that downloaded files are stored? My android box has several pre-installed Apps and one is called ” Appinstaller. ” I am concern that the 25 apps that I installed are taking up valuable space on the local disk. Am I right? Is this a problem? Shoud I uninstall these apps or leave them alone? Thanks in advance for any help to my question. I’d uninstall any app that you KNOW you’re not going to use, just to clean things up. Android apps are usually small enough not to make much of a difference in storage. But you can check how much space each app is using in the Settings menu. On an Android TV (Sony Bravia), after doing all steps succesfully and clickin “Install”, pop up a box with the message “Package installer” and a radio button to click. Then, in the same box, there are two buttons: “Always” and “This time only”, to go on with installation. But you jus’t can’t get to any of the buttons (with the hand control). The TV has two app called “Package installer”: com.google.android.pano.packageinstaller and com.google.android.packageinstaller. Any idea how to overcome this situation? I got the same problem, did you find a solution? I got the same issue. Any solutions?